Proof that I really am knitting! I had to rip out part of the left side panel and correct the decreases, but that didn't take as long as I thought it would. Now I'm working on the first sleeve. Hi, Welcome back!!!! I see that you inadvertently participated in the Rip-Along hosted by Alison. Your sleeve looks good. Hi there, pretty cable cardi. I was thinking about your sleeve increase issue yesterday while looking at some cabled sweaters at Eddie Bauer. 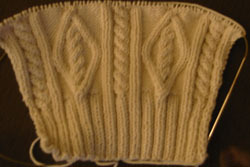 Lots of them just had reverse stockinette at the arm seam. It looked good. Another thought - Jenn of Extreme Knitting just finished this sweater, you might ask her what she did. She's at http://www.xtreme-knitting.com/Knitting.htm.